Major concern for retirees is the running out of money during retirement. 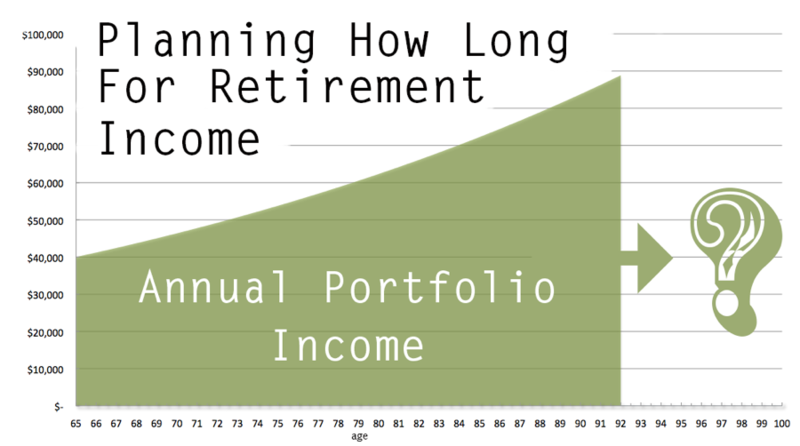 You have accumulated a portfolio for the last three decades while working now you have to make that money last with pulling income for the next 25 years or is it 30 years or 35 years? Here lies the problem. How many years will I live so I can figure out how much to pull from my portfolio every year without running out of money. Yet without knowing the time period, it’s impossible to know if you should be spending more or less and if the investments in the portfolio can be more conservatively invested or be somewhat more aggressive in your stock allocations. 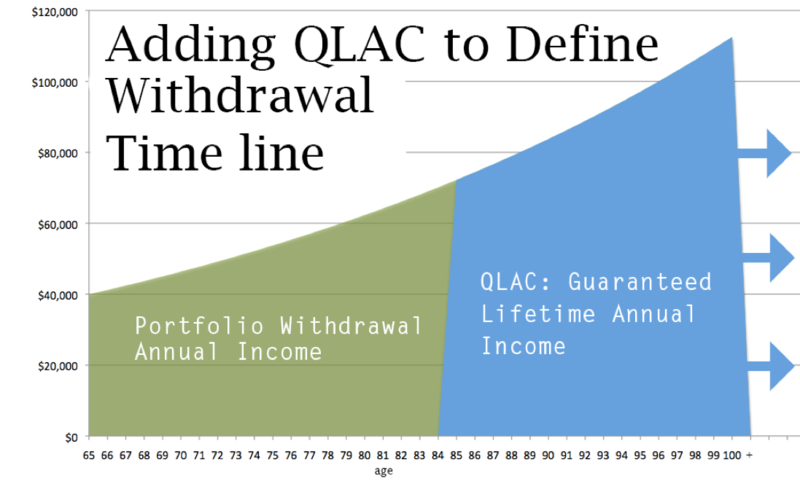 QLAC, also known as a longevity annuity, provides guaranteed lifetime income later in life. The income start age is chosen by the owner at deposit which must begin by age 85. The benefit of using QLAC in your income planning is to solve for the unknown time period problem. As an example a 65-year-old couple that purchases a QLAC with income starting at age 85 will cover all of their inflated income needs after age 85. Now the couple’s retirement income question just got simpler. They will now only need to solve for the income for the next twenty years (age 85), which is defined, as the QLAC will provide inflation adjusted income for life after age 85. The 65-year-old couple has $1,000,000 and wants to spend $40,000 per year from their retirement portfolio for the rest of their lives and increase annual payment 3% per year for purchasing power in the future. $40,000 per year increase for inflation every year will be $72,244.45 per year at age 85 or in 20 years. Today the couple can purchase a QLAC also called a Longevity annuity for their future $72,244 per year, or $6,020 per month, beginning at age 85 for a one time deposit today of $260,000. The QLAC or Longevity annuity purchase will leave the remaining $740,000 of the retirement portfolio available to cover the next 20 years from age 65 to 85. Since QLAC has a limit of $125,000 deposit the amount can be split among both of their IRAs and or non-qualified longevity annuity. All have the same deposit and income payout terms. The couples “problem” just got a whole lot easier to figure out now, instead of trying to invest $1,000,000 for a $40,000 per year inflation-adjusted retirement income for an unknown time period. The couple can invest $740,000 for a $40,000 per year inflation-adjusted income for exactly 20 years, secure in knowing that all payments beyond that point will be covered by the QLACs and backed by the longevity insurance company guaranteed lifetime income payments. The QLACs will also allow the couple to take more risk in their portfolio knowing the guaranteed lifetime income payments are not to far off to cover the unknown retirement income time horizon. For a no annual fee QLAC and no free quote see www.QLACQuote.com where we compare all QLAC approved companies to find you the best income amount.